It took me a while to get my head around the Eagle Gallery’s first themed exhibition of 2013. Poetry, song lyrics and music can provide inspiration and ideas for visual artists. The theme for this show is to take one of these sources of inspiration as a starting point for your work. We would also like to display next to each piece an A5 size card on which you have written the piece of poetry, song lyric, or title and information about the piece of music you have chosen and why you have chosen it. It dawned on me I don’t widely see imagery while listening to music, and I’m not into poetry at all. The only connectivity that comes to mind is The Boomtown Rats song “I don’t like Mondays” and a Doctor Who annual cover with an image of Cybermen on the cover. This is down to playing the song over and over again as a child while starring at said book. I thought pick a song and try to see some images. I chose Nik Kershaw’s “Wild Horses” (love the key change) where I would have a horse perhaps reflected in water forming a circle as though a record going around. Aim for lots of movement and blobby colours. I was somewhat uneasy about this until I had the revelation that with some songs I’d often imagine performing as though the lead singer. My version of “Subculture” by New Order climaxes with me running down the centre aisle of a large theatre, past the audience donned out in dark glasses (Issued to all under their seats before the start of the show) and gaining access to the stage via some sort of trampette over the orchestra pit. I am then attached to a wire so I can be pulled to the back of the stage onto soft cushioning at great speed at the Climax. Hmm – couldn’t work out how to turn this into a painting so I searched my memory banks for other such imaginings. Unfortunately I don’t see flowers and meadows when I listen to music, but sometimes I will have ideas of how to perform the piece as if I were the lead singer. Here, I see me pointing aggressively at my ring finger to the line “silver and gold - all I was told”. This “Goodbye Mr. Mackenzie” single may not be widely known, but I adore the way it builds to the lead vocalist just screaming at the end. Is it sadness? Is it anger? My eyes looked up to heaven. And you sprang from the ground. Where have you been my blue-eyed one? give me silver and gold. 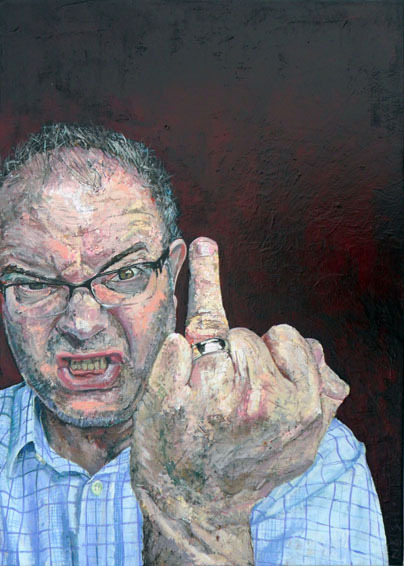 This piece has certainly caused some interest – some find it offensive and worry about my relationship with my wife. I see at playing a roll and not autobiographical at all – but there is no convincing some. Many of my artist colleagues like it – which is greatly encouraging and I feel proud that it causes a reaction beyond marks on a canvas.